Fun game, much more difficult than Plague Inc to start but gets easier as you figure out where to put funds and how to strategise military. Lots of depth, infinitely replayable. Amazing game for strategy development. Brain food. I love it. 1st game I played, most fun I had playing a phone game. Honestly thought I’d be totally lost as to how to play this. It took me about 5 minutes if that to figure out the proper way to play and learn strategies for a solid win! Enjoyable Game with a Great Design! Just played the casual campaign a few time, and I’m 3/4 for wins! I very much love how the game feels like the board game ‘Risk’! It’s a blast! I love Plague Inc, this game is an awesome spin on the concept! Very fun strategic game to play when you have time to pass! Only played a few rounds of this and I already love it. It’s hard not to enjoy the content these people create. 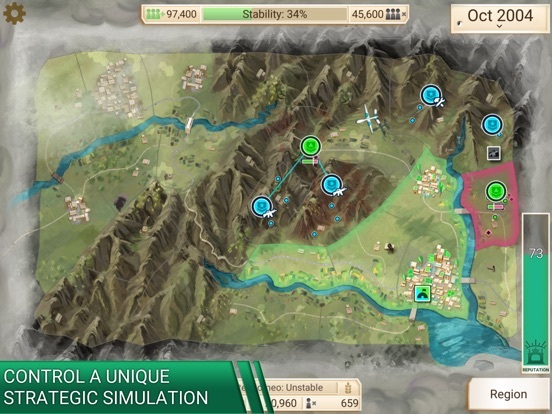 If you like the mechanics of Plague Inc then you’ll love Rebel Inc as well. Definitely worth your time. A lot of fun to play!! I look forward to more maps and characters!!! I like how much more interaction this game has compared to plague, and the choices add a whole new element. okay, i guess i can lighten up on politicans. just kidding! but i loved plague so i figured that i would like this too. just as fun but far more complex— all in all, makes for an incredible game. way to go! This is a fantastic game, well worth the $2. I think it’s a cool game, Keep working on it and I’m sure it could get better. Very good game very realistic. If you enjoyed Plague Inc, you will enjoy this one too. It’s got everything that I loved about plague inc but even better! It’s worth the price trust me. Base game is fun and really challenging, but so far the advisors are useless, their boosts are negligible. I really hope they get rebalanced so they have more impact on how you play. Never rated a game before, but this was well worth the money. Play the game on casual and it’s quite relaxing. The game is pretty good. Has decent graphics compared to some others I’ve played and is well designed. I haven’t noticed any glitches or ads popping up. If you’re into a strategy game with some extra time on your hands, I’d recommend it. Just started playing and I like it a lot, a few places where it could be polished but there is a great potential and would love it if they keep working on it. It’s fun, an a quick way to pass the time, great for road trips and lazy sundays. Exactly what you’d expect from a brilliant company. Same idea as Plague Inc.
Having security may seem weird and unneeded, however. The progress in this game is hindered when corruption and outside instigators try to disrupt stabilization of your region. Working towards the goal of peace and prosperity is key, with militia guarding borders and you building up a place people WANT to live. I.e. Safe drinking water, medicine, education, jobs. Etc. An interesting game on keeping the populace happy, and keeping them safe. It’s a fun, strategy, time killing game, and some times challenging. It’s a great game. As if the games Plague Inc and Civilization combined. If you enjoy the Civilization series, than this is for you. It has the same feeling of ruling over a nation and its military with the Plague Inc. controls and setup. The devs have done a great job with their new game! Definitely worth the money. I recently bought this game because I payed one of you’re previous games, Plague Inc. and I was not surprised by the amount of fun I had with this game. It was initially difficult at first, even on casual. But with being a veteran when it comes to these types of games, I quickly caught on to the gameplay/strategy it takes to beat this game. I had a lot of fun overall and I highly recommend others to play this game as well. This game is currently unbeatable. There is no way to beat the third level locking you out of any of the extra content unless you buy is. Shameless cash grab attempt by a company I used to respect. Unwindable games are not acceptable. The people who brought us Plague, Inc. have succeeded in repeating the trick of making a great in-depth game with a high replay value. It’s easily worth the $2 price! Very fun game where strategic people can really shine! It’s even fun for newcomers as the difficulty settings and tutorial help you understand the ins and outs of the game. This is a very fun and strategic kind of game for those who want a challenge. A very intense game that puts one on edge when insurgence soldiers invade your Provence. It’s fun though. This incredibly nuanced game has all the hallmarks of being a lasting classic. Wherever you’re looking for something to quickly pass 15 minutes, or an in-depth strategic challenge, you will be satisfied. Layering several levels of control, with multiple paths to victory, this game provides freedom in finding the right way to stabilize your region. This is a worthy successor to Plague Inc. The game is extremely well polished, the design is simple and strong. But the insurgents are way too powerful. When I block out insurgents from escaping and have another unit destroying them they push on my blocking units. Once they get repelled the insurgents don’t go back to where they came from, they just walk through my troops like nothing happened. 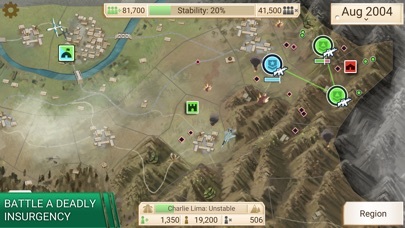 Also, it is extremely annoying (and unfair) that once I stop insurgents in one area and make sure for the red to go away I relocate my troops to stop the next insurgents, 5 seconds later they just reappear at the area I just cleared. And now my reputation is down halfway. Both this game and the original virus game are fun strategy games. Pretty interesting concept. Hope at some point you can control the rebels. Just played my first game! Had a lot of fun! It was super simple but had a lot of fun options I can’t wait to explore, love Plague Inc, this is great! Well worth the time to escape life and pretend to battle insurgents! Balancing on a tightrope of carrot and stick. Great! Too hard for me though. I can’t beat this game. If you thought Plague Inc was tough, imagine being a communist dictator trying to keep a good reputation while burning down the nations around your country. I’m thoroughly enjoying this. I think it’s even better than plague inc. If not better! I really enjoyed playing this one and am glad I saw it! Feels like playing Plague Inc with opposite goals and twice the fun. Amazing. The second level is rediculously stupid!!!! The insurgents literally come soooo fast!!!!! You have no time at all to collect money enough for soldiers to stop the insurgents let alone get the money to lower corruption and raise stability at the same time Honestly the WORST game I've ever played!!! If I can give it 0 stars I would!! Waste of money, waste of time and waste of an app DO NOT BUY THIS GAME!!!!! This is an amazing game that takes a lot of strategy and hard work. It puzzles you but then leaves you satisfied as if you have saved a nation. I believe it was worth the $2 because I have had a lot of fun with the game and will continue to do so. Thank you James for spending so much time on a game for us people to enjoy for a price so cheap. Rebel Inc is a fun, challenging and accessible strategy game that's well worth the price of admission. Truly a worthy successor to the brilliant Plague Inc. I'm excited to see how the game will evolve over time. I really enjoy game designs like these and for me they are the best to play. Brutal mode is way too hard. The hrs of game play from casual/normal are worth $2. GAME DESCRIPTION: At the start you unlock characters, maps, & various skills by stabilizing a region. You stabilize the region by “creating” a government, implementing services for the citizens, building a military, fighting rebels, & delicately handling inflation & foreign affairs. The rebels try to take over areas/ lower your reputation. If you lose your reputation you lose the game. The game adds a “corruption” meter as well. You can make a peace deal with the rebels &/or hold elections to stabilize the region. EXPECTATIONS: The Graphics are like a board game. 5 maps, 5 characters, 3 levels of difficulty... 18-25minutes per game. CASUAL Mode: This setting is for learning the game. It is fun. You may lose once or twice when trying to master the new unlocked characters. NORMAL Mode: You must beat this to unlock new maps but it requires more skill to beat. Expect to lose a few times before a win. (Challenging to play). BRUTAL Mode: An almost unfair leap in skill & luck is needed to win. This is NOT Fun. You will lose MANY times. Making you feel frustrated and like you wasted time. MAJOR PROBLEMS WITH THE GAME: -BRUTAL mode is too hard. -Each Bonus is not detailed in the game making it harder to evaluate what to do. -Being moral is often costly in the game. -Major Lack of control of when/ where to build garrisons and facilities like Universities and Power plants and when air strikes occur. Some Unlocked characters are not fun to play. Example: The Smuggler character makes $ on corruption but the towns people dislike corruption...so this is a wasted character. 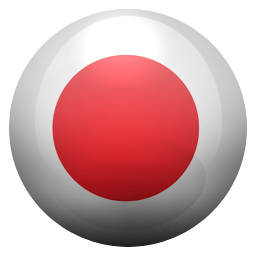 -This app NEEDS more features. Maybe a “create your own map/region” feature or just more maps, as well as more characters. DLC: If you buy the extra characters/stages for more $ you are robbing yourself of fun at the start of the game. Brutal mode is so hard that even w/ the unlocks you will struggle and be frustrated. You unlock everything naturally so save your $ and just play the game. This game is awesome because they took there old game kept the format (to some extent) and made it greater. I love this game because everything that happens for most of the game is determined in the first 3 minutes because most upgrades take time to be used (which they should) and the in depth timing strategy you have to use throughout the rest of the game. Love the maps and love that the governors are radically different from each other so each game takes different strategy. There is really one thing I don’t like about the game it’s that when you put troops in a zone if you haven’t scouted that zone already your troops wont help neighboring zones fight which is kind of anoying. Some suggestions for future updates (although I know you already have great ones planned) it would be cool if we could play as the underpowered rebels and try to either get the best peace deal possible or just take over. And it would be neat to see more types of military troops maybe like dogs that sniff out and tell you where the next zone to be attacked is or some riot control that contain insergunts until you can send in real troops to wipe em out. Thanks for another great game please keep up the awesome work! Really enjoyed the premise of this game. These guys did a great job with Plague, Inc. and have got another good game going here. This time around is more like fighting off the infection rather than causing it. Really enjoyed the various mechanics of the campaign to improve the board, make my soldiers better, and reduce insurgents. Felt like there was a meaningful balance between trying to make improvements while limiting outside influences and corruption. There are elements that feel in place just to slow progress that I felt could be improved. It would be nice to have more focus on intelligence in the campaign as ways to reduce insurgency movements. This was my biggest complaint (and not that bad, more of just a gripe). If there was a way to predict and then counter insurgents movements to better my combat that would make the game better. Also, wish I had options for some sort of special operations or covert action force to go into an insurgent held area to somehow reduce their impact or remove their leadership to slow their progress when I’ve got main forces committed elsewhere. And it would be nice to select where I send airstrikes rather than just wherever insurgents are. This would give better control over potential civilian losses. I've been playing this game for about a week now and I like it quite a bit. I'm reading the negative reviews and the things that are being complained about are actually the reasons why I like the game so much. It's not a run-of-the-mill strategy game, not a war game, not a building game. It is exactly what it should be, representing the struggle of trying to stabilize a region after it has been devastated. People are complaining saying "If you invest in the military you can't pay for civilian improvements! If you pay off corruption, you can't afford to fight off the insurgents!" To all these things, I say, yes that's how it is! That's what it's like, trying to stabilize a region. It's reality. That's what makes it uniquely challenging. It isn't impossible, it's just difficult to balance priorities. Every move has to be done carefully, every dollar has to be spent wisely. There's a unique strategy to this game, and it requires learning a sense of balance in order to win. I really dig it. I gave it 4 stars before because it didn’t have much content, but now I’m giving it 5 stars because new maps and governors are being added! Thanks, developers! Since my last review vanished, I’ll add it again. I concur with what a lot of people have said, it has an amazing amount of potential...however... it has some serious balancing issues. I played all the maps, viruses, and difficulties on plague inc, it was challenging and sometimes frustrating, but failure was usually due to my long-term strategic or short-term tactical failures. Rebel inc. doesn’t seem to share that value, many things just drain reputation or skyrocket inflation and corruption without much benefit. The costs of countering insurgents are also highly unbalanced; i fully understand risk/reward play, but the rewards of the military upgrades just aren’t enough. Also, I really miss the customization of your viruses, there’s virtually nothing like that here. You get different governors but their effects aren’t that extreme, or game changing for the most part. Adding things (like the dna changes in plague inc) would be nice, smaller bumps are standalone, bigger bonuses would come with trade offs, etc. You could couple them with your favorite governor and do a min/max sort of thing, high risk/high-reward and all that. So far, I ran through all the maps and governors, and haven’t had much interest in going back; there just isn’t much replay ability to pull me back. Great game from the makers of Plague Inc.
Can’t get enough of this, especially after the addition of advisors (similar to genes in Plague Inc.). You unlock those by winning games and can use them in future play-throughs. Some are useful, others not so much. Each governor is different from the other, so your strategy will change. With the Economist, you have to use your cash sparingly, since you only get a new influx once a year instead of once a month. With the General, you can get a head start training troops and building garrisons (all others have to wait for insurgents to show up). The General also has awesome upgrades for troops that turn them into killing machines. Unlocking the Warlord is tough: you either have to beat every map with every other governor on Brutal difficulty or pay real money. Unlike Plague Inc., initiatives take time to deploy and spread. Just because you purchased a highway improvement doesn’t mean all highways are instantly fixed (hey, real life is like that!). You can also invite international organizations to help you for free, but at the cost of increased inflation and corruption. 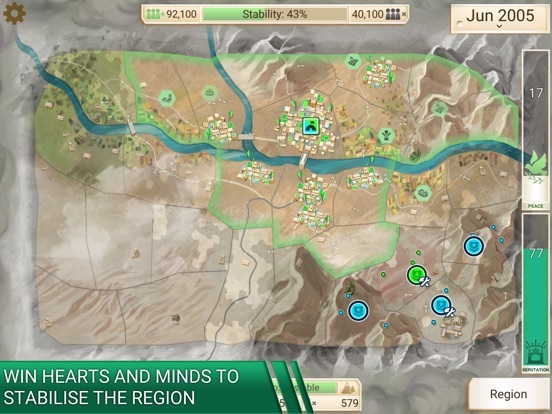 Rebel Inc is a phenomenal game, for its exploration of the complexities and nuances of political decisions, management of infrastructure, all while conducting a civil war. There is a lot going on, but it never feels overwhelming thank to an intuitive interface, and an integrated tutorial system that highlights mechanics with well timed prompts during gameplay. 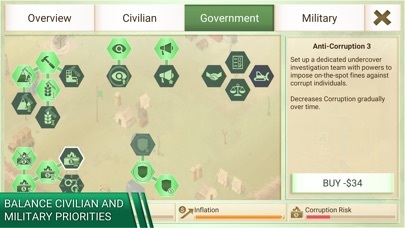 On top of being a great game, Rebel Inc. allows the player a more involved and realistic insight into the realities faced by many government bodies in the world today. Many of these third world countries, especially those with war-devastated infrastructure find themselves in a tight position between first world powers with conflicting interests, the exploitation from first world industrial powers with interest in raw materials, and the crippling consequences that come with failed loans from the World Bank. I hope that, as the game expands, that it will delve further into these complex issues. With the additions made in the latest update, I see that beginning to happen already. Thank you James and the Ndemic Creations Team, you have produced a phenomenal gaming experience. 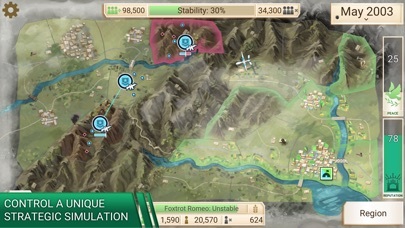 The amount of strategy required and the simulation that this game provides is insane but needs more to be able to live up to its predecessor, Plague Inc. We need more choices, maps, governors, balance out the insurgents by either reducing their overall strength or increase the power of our national army or coalition. The insurgents just pop up so quickly to the point where it is EXTREMELY OVERWHELMING. If we could recruit new armies quicker and more efficiently, it would balance it out more. Or just reduce how quickly our reputation goes down because of the insurgents. But I’ve lost count of how many times I lost because the insurgents just wipe the floor with my armies even after I upgrade them but the upgrades seem to make such little to no difference. I loved the game at first but it has too many balancing issues. I can’t wait to see what’s in store for the game in the future and I hope it matches or becomes even better than Plague Inc one day. James and the team are great devs who always seem to listen to any feedback. I have a lot of faith in them to expand on this even more. Potential but needs serious rebalancing. Good game, but it needs a serious rebalance as of right now the brutal difficulty is virtually impossible to beat on map four. The insurgents are too strong and pop up in three separate zones. There is no way on Earth to contain them and often they’re stronger than your coalition troops. Corruption is out of control as well and upgrades don’t seem to help at all. I’ll re-evaluate my rating once the balance issues are addressed. Edit:// Updating and dropping my rating. Everyone giving this game good reviews is playing the first few missions which are interesting and fun. Once you get to the later levels it’s literally impossible to win on the harder difficulties. The final mission is so obscenely hard I’m astounded. Coalition troops can’t win even with four armies supporting them. Regions will not stabilize even if you have half the upgrades purchased. They go up one tick per time unit, but you’re losing rep at a rate of 3 per unit. Simultaneously the invincible rebels are swarming zones non-stop and demolishing your rep. This game has some SERIOUS balance issues that need to be addressed and they don’t become apparent until you’ve played for a bit. Now I love plague inc. so when I saw this I was super excited, but this game is ridiculous. First off the people you gave to use in order to unlock other areas do not support what needs to be done on that specific map. The insurgent rate at which they spawn is absolutely absurd. Coalition forces need to be able to stay spawned longer. You literally have to choose either do what needs to be done for civilians and let the insurgents run rampant or choose military over civilian development but you cannot stabilize the region. Corruption is increased wayyyyyy too fast with no quick way to bring it down. You literally have 18 months to two years to develop the area before the bad guys show up, sometimes they show up in one spot and other times they show up in 3 different sections and that is when you just start your game over. You lose reputation like it’s a $1 sale, once you start ticking down because of the stability just restart the game because you will not get it back fast enough. The spawn time for the national forces needs to be shortened since the coalition forces can be summoned almost immediately. I would give this game an honest -2 stars, very very disappointed. This game starts out cool they kept they old format from plague and it works ok but after you do the first level and you get to the next map you have to use the economist leader to unlock the next map. Well this is virtually impossible even on casual...you earn money WAY too slow while the terrorists seem to grow at an inordinate pace. Even if you use the civil leader on the second map it’s almost impossible because the terrorist grow too quickly. This game is only fun if you use it as a time killer and you play on the first level with the first leader that’s it. ***update*** AFTER PLAYING THIS GAME FOR LITERALLY HOURS ON END AND TRYING EVERY DIFFERENT TYPE OF COMBINATION IMAGINABLE IF YOU PAY THE CORRUPTION OFF AT THE BEGINNING OF THE GAME YOU DONT HAVE ENOUGH MONEY TO COMBAT INSURGENTS. IF YOU PAY TO INCREASE HEALTH AND EDUCATION AND WATER YOUR CORRUPTION GOES THROUGH THE ROOF. IF YOU TAKE STEPS TO COMBAT CORRUPTION THEN AGAIN YOU DONT HAVE MONEY TO DFEAT TERRORIST. IF YOU SAVE YOUR MONEY YOU GET ACCUSED OF WASTING MONEY AND HURTS YOUR REPUTATION SO YOU SPEND A LITTLE ON MAKING LIVING BETTER AND TO COMBAT CORRUPTION THEN USE SOME TO GET A MILITARY COALITION AND NATIONAL DEFENSE FORCE YOU HAVE A CHANCE BUT THEN THE TERRORIST OUTPACE YOU ON GROWTH HURTING YOUR REPUTATION. THIS GAME NEEDS SERIOUS HELP IT WOULD BE GOOD IF THE TERRORIST DIDNT GROW AS FAST, NATIONAL FORCES TRAIN MORE QUICKLY, MAKE CORRUPTION AFFECT YOUR REPUTATION LESS. So far I have loved playing this, already put over 5 hours into this game. I played Plague Inc. for a long time and I can say this can and will be a better version of it, I love the extra depth they’ve added, whether it’s negotiating peace relations, interacting with your coalition and such. It’s also very challenging because the enemy can be very brutal even in normal mode, which can take a lot of time testing the abilities and understanding how to use your military with just the right timing. I personally feel like the enemies toughness could need a little lightening up but you don’t want to lose the challenge either. It can be very satisfying when you finally destroy the insurgents. Lastly, the tutorial and tips are very good, I would just ask that you help us understand the peace process a little better and how to end the game. Thank you for a great follow up! Keep up the work! The many things you have to manage makes it feel like a more I. Depth The Dictator game but actually seeing your success and failures on a map. A cool idea is more types of units. If you get enough reputation more and more blue soldiers (blue soldiers are better but not native in the city so the occupied do not like them, and green ones are native there and receive much less hate from the occupied) to come. For the insurgence they should get black soldiers (there is a chance that outside countries can help the insurgence but it only makes them harder) that are more elite and would spawn on the map. A problem is a lack of role play. If I want to play as an authoritarianship I should be able to march soldiers faster which will hurt reputation as well as having faster national soldier training times and more of them too. To deal with that you could threaten journalists to lie about you or occupy urban areas to stop corruption. You want your stupid review, here it is. First off, this game is extremely unrealistic. Second, the mechanics are broken stupid. Third, sure the creativity is great! ; maybe the devs should stick to killing off everyone with infections rather than trying to resolve conflict. Why do I say these things? No country or it’s people will demand things that a government can’t provide during a war with the enemy in its own country. The governors are all idiots because they raise corruption and inflation . Why don’t you actually let us input some type of government without becoming totalitarians. And you make the insurgents completely stubborn when clearly the players can (at multiple times) corner them. But the game spawns some idiots in the darkest corner of the map to drop my reputation in a heart beat. Creating a military doesn’t cause corruption if it needs to fight a war. 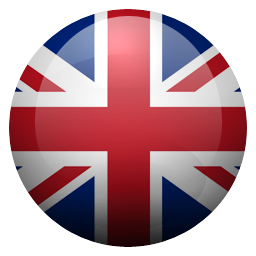 If people wanted to stabilize their country, they wouldn’t act the way they do in this game. Sure it’s just being optimistic but you guys don’t even input all of the realistic aspects of life and politics into this game to make it as hard as it is. Fix it, I’d give it no stars. Just like plague in I fell in love with this game from the start. The strategy is deep yet easy to understand. Inclusions like the different maps and governors add variety’s to the game that plague sometimes lacked with every designer feeling the same. The games difficulty’s feel well balance except for the the insurgents. They are not impossible to deal with but they feel to strong. You know you have a problem when fully upgraded soldiers with air support and a nearby garrison stubble to liberate a tile. In addition while the fact you have to encircle insurrectionists to eliminate them is cool in theory it is hard to do in practice. The fact they can basically spawn anywhere(with some map specific spawns) means that it can be up to ring to decide how easy it is to deal with. Sometimes they spawn on a corner and can be easily surrounded . Other they are in the middle of the map and spread like a plague. This will be 5 stars once the insurgents are either nerfed or the soldiers are buffed. This game is a lot of fun. Unfortunately there needs to be a balance between each aspect of each part. You cannot focus on heavily gaining military advantage, you need to balance the reputation of yourself by support from the public, gain military advantage while keeping your combat abilities somewhat high and keeping your civilian’s support (you mostly use a foreign military which the public doesn’t like) and try to find a negotiation with the insurgents while keeping your corruption down and reputation strong. Every new aspect you provide to gain public support adds corruption to your government as your underlings gain money and bribe others to the cause, so you need to focus on “anti-corruption” deals. The basic rule of it is to find a strategy that is as balanced as you can make it. The game is fun, but extremely difficult and is meant for the patient and strategic thinker. Only had the game for two days so far. In that time, I have developed a crush on this app. It’s fun, there is no doubt about it. If you liked Plague Inc, then you will be easily seduced by this game. I plan to update my review down the road, but so far I recommend it. The only cumbersome problem I have right now is the unlocking of the advisors. I’m not sure what they actually do once unlocked. They don’t *seem* to have any effect on the game, but perhaps I just have not noticed it yet. I am struggling with the hardest play mode. It seems I have tried every combination and can’t seem to win. Hopefully I will be able to master it, however, right now it just makes me crazy. Anyway, definitely worth a couple of bucks to purchase. My only real complaint so far is I don’t like buying an app and then being asked to buy additional add-ons later. Thanks for the new game! A great game initially, but insurgents are extremely frustrating. Let me just start off by saying that if the insurgents were fixed and had more ways to deal with them, this would be an easy 5/5. Everything in the game is so strategic and balanced and just fun to play with. I’ve spent several hours so far on this game as well as Plague inc. The big thing holding this game back is the Insurgents. They are unbelievably powerful and numerous. They keep coming and can seemingly spawn literally anywhere in the map, yet you can kill them unless you surround them on all sides of their territory, which can require up to 5 military units! It’s ridiculous and extremely annoying to deal with. A good fix would be to have the option to upgrade your units in a way to where they can kill them without having to surround them, or something along those lines. That, in my opinion, is a major flaw and is borderline game breaking. The game is fantastic otherwise. I’m very new to Rebel Inc. Although I have played Plague Inc. Brutal Mode on the first map, is a little too much brutal. I’ve lost plenty of time for the National Soldiers taking way too long to train, while half of the map is being taken over by insurgents. I’ve been using Coalition Soldiers to defend them, but then their contract runs out and I lose from the reputation going down so low after i extend it. Even if i sent them home, I STILL lose from the insurgent occupying half the map. I know it’s called brutal, but, it seems a little unfair. Also it would be better for coalition soldiers to be able to be redeployed. Either make the reputation going down for extending less, or make National Soldiers a little faster in training and movement. Not saying change the game, just small improvements. Thanks! UPDATE: Game is unplayable in current state. Insurgents are much too powerful. Coalition soldiers never stay long enough. Zones are not stabilized fast enough. Everything takes too long and is too expensive. Not fun. I do NOT recommend this game until they completely fix it. So far, waste of money. I really like this game. Its exciting and in somewhat the same format that Plague Inc. which works and is fun...but the game makes it way too hard for you too advance. Im on the second mission of this game, and even on normal mode, it just becomes way too overwhelming and difficult to push back insurgents. First it takes time for military too arrive at a certain destination, and you cant even get your military started until there is a military threat, so youre forced to choose temporary soldiers for fights. When soldiers do get on a point correctly the insurgents move away almost immediately and start attacking another zone way faster than they should. Insurgents are incredibly broken in this game. I want too like it, I do, but time and time again, insurgents ruin everything and I have no control over it. - Insurgents come too quickly and come in way bigger numbers than they should. -Temporary military will only stay a little, but regular military takes forever to train and deploy. - With the amount of insurgents and the amount of military given, insurgents will always win. The game is good, but they need to rethink the whole threat level. This is pretty awesome! And a question to Ndemic creations! 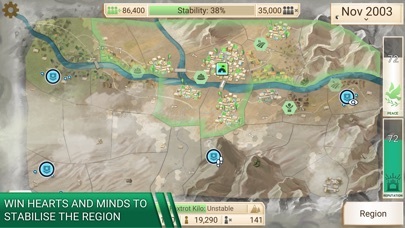 This is a wonderful game and it’s interesting how you stabilize a region in a very realistic way like dealing with Insurgency as you are stabilizing the region also I love some of the elements from Plague inc. being thrown into this game!So yeah this is an amazing game to check out! Thanks you so much everyone at Ndemic creations for making this game and I know that this game will be even more awesome in the future! Also I have to ask all at Ndemic creations are there going to be custom and free scenarios like the last game?And are there going to be special scenarios like the Simian Flu in the last game MAYBE like one based on War For The Planet Of The Apes “Loudly coughs “ Suggestion! Sorry don’t know where that came from but please respond if you can! I’d like to get feedback from you guys! This game is Phenomenal, very nice set up and great game play. It’s strategic and exciting however it an be very difficult even for casual mode. In game it says you will get paid every month, but on the second level I only get paid about every 6 months. I barely have enough soldiers and sometimes it takes them 2 years to get trained. I don’t get why the civilians complain about the enemies attacking them when they complain about our soldiers attacking them. No matter what I do the civilians complain. They complain when I spend to much money or I don’t spend enough. It’s almost impossible to stop corruption if you can’t get paid within 3 months. The games two hard even harder than your previous game. Please improve gameplay and style. Other than that the game is great. Good? Yes, but there is always room for improvement. I bought this recently because it was made by the same developer as Plague Inc, one of my favorite mobile game developers. This game definitely resembles the dev’s previous work, and I look forward to future updates. However, some complaints. 1. Sometimes the UI will bug out and prevent me from backing out of a selection process for map, governor, or difficulty selection unless I restart the application. 2. The overall difficulty of the game is alright, and the different governors with different map combinations help make them feel more alive. However, adding in the DNA modifiers like in Plague inc to help boost/hinder the game’s progress would be a welcome addition. That’s about it for now. Looking forward to special scenarios, additional tweaks, and some new features. I love this game and am also a fan of Plague Inc. I have beat all the viruses on super brutal so I came into this game with plenty of experience and still find it challenging but possible. A few suggestions, a actual rebel mode would be amazing! If you could rebel and conquer an entire continent rising up from rags to riches! Another suggestion is an endless mode. I think it has tons of potential in which you could stack your army in the same country and have even more types of army’s like riot control or the navy. You would battle against endless waves of insurgents and enemies as you rack up and endless and unstoppable army! I hope you consider my suggestions as I think they would make the game better and much more diverse. This is a really fun game. Great way to pass time. The game gets more and more challenging as it goes and really tests your ability to plan and choose upgrades appropriately as well as manage funds. I reduced a star because the information pop ups that occur constantly throughout gameplay are incredibly annoying. 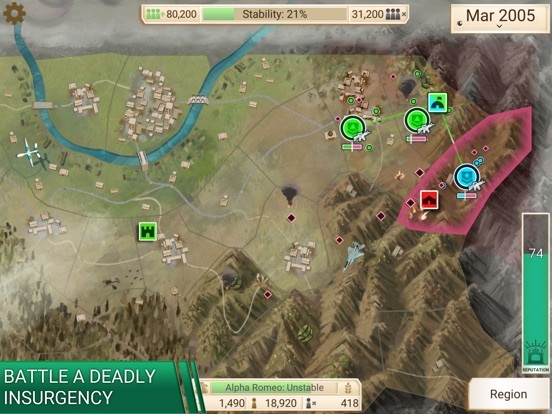 I’ll be really focused trying to move troops around to corner insurgents before more show up and a pop up will jump into your face telling you that troops are in a certain region. Like no crap, I just put them there. Also, the info pop ups that tell you how to play the game even though there’s a tutorial are annoying too. It should be logical that if I’ve unlocked the level by playing previous levels, then I know how to play. I’ve played this game a lot for the few days I’ve had it downloaded and it’s actually really really fun and I’ve never been one for strategy games but this does it amazingly well! It does a great job at making it seem like you have complete control over what you do as a political figure and a general in a war. My problem (however minor) is that the text in the game just seems slapped on and it kinda takes away from the immersive experience. This has nothing to do with the gameplay which is amazing on its own it’s just something I noticed that would make the game a lot better in my opinion. 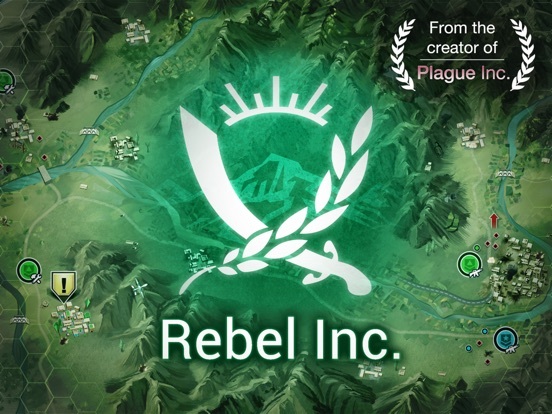 If you like Plague Inc. You will love Rebel Inc.!! 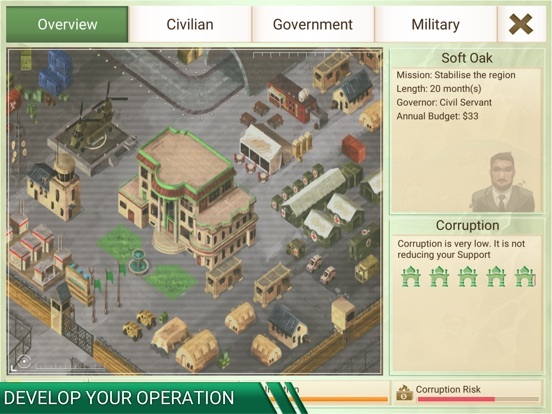 James has taken the game style of Plague Inc. and with it has created a similarly-played game with a great window to the US Middle East operations. While our media only shows the civilian casualties, drone strikes, and rebel negotiations, this game reveals the sources behind our current knowledge (or lack of) in the Middle East. 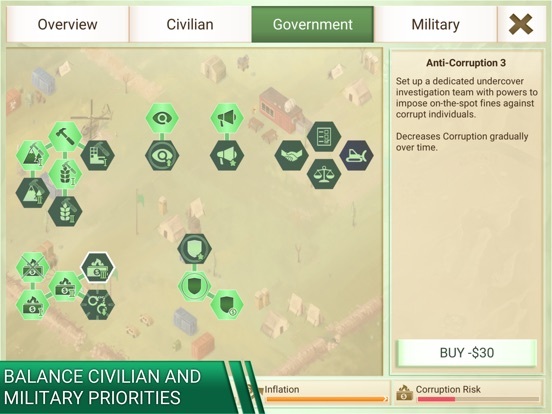 From balancing initiatives and corruption to deciding on ruthless internationals or weak nationalists as your region’s defense, every aspect of this game puts you on the line on whether a cover-up works, an insurgency get rerouted, or whether the peace talks fail. While I could go on and on, I can only say two things. To those who own Plague Inc, this won’t disappoint you. To those new to this franchise, hop right on in! First, I want to say I absolutely love this game and it’s a wonderful, detailed game, and very easy to understand. 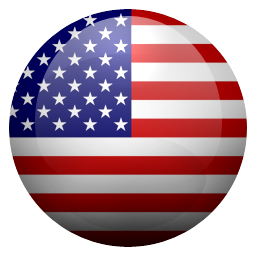 Now, given the real world’s current situation, historical events and the game’s starting date it is very clear that this is based on the United States’ involvement in the Middle-East. But this game is based on the part of the war that actually brought good to many places in the Middle-East, until the U.S. killed Saddam Hussein and then stopped stabilizing the area. This game gives you a great opportunity to go back in time and play out the situation as if the U.S. didn’t rollback it’s involvement in the Middle-East in 2006. Tip: max out anti-corruption as fast as possible. I absolutely love the twist on the plague inc. game style. Definitely the type of strategy game I have been looking for! Seems to be well worth the $2! Very well designed and fun graphics! One thought came to mind: throughout the game we are presented with options pertaining to peace deals, elections decisions, etc. Some of these options cost various amounts of money and I thought that it might make sense to add our current wallet/bank amount to that screen in case it affects our decision similarly to when we’re spending our money on the initiatives screens. Just my opinion. Thanks again for the fun game! The entire team did an absolutely incredible job! Great work! After years of having the life scared out of me countless times by Plague, Inc., Ndemic drops another amazing game in the form of Rebel, Inc. Instead of just being another military strategy game, this one has an amazing mix of political science and military strategy. You fight government corruption at the same time as you're fighting an insurgency, while trying to stabilize the region by gaining popularity, loyalty, building relationships, trust with the population, and infrastructure. Ndemic, I hope you read this. You guys are geniuses. In a market saturated by the same things over and over again, you guys have created an amazing style all of your own. Thank you so much for sharing it with us. Cheers! Game is fun at the start, and I did get my 2 dollars’ worth of entertainment. That said, I’m done with the game and will move on to better games now. My issues with the game are: 1. You can have a single insurgent and he’s immortal unless he gets completely surrounded, AND there’s a multiple bases spawning enemies like him, and the number of insurgents is random, and you’re woefully unprepared to deal with them early on. I have to restart stages over and over until I get few enemy spawns. 2. The list of investments is full of newbie traps, and it’s not at all obvious what they are. 3. It takes ages to train national soldiers; in fact it takes so long that coalition soldiers have to leave well before your national soldiers are out, which means you’re forced to take massive reputation damage to keep your coalition soldiers around against their will. 4. There’s not that much strategic depth. You figure out which are the good investments and in which order you should get them, which are the bad investments to avoid, and then you always do the same and you win or you lose depending on how lucky or unlucky you get with random events and (especially) with insurgent spawns. It’s somewhat fun, but it’s mostly just frustrating. Can you find any better game? This game honestly supper fun to play. You can by pass time and have fun. You are commanding a operation. While you are commanding you are stabilizing regions on the map. It gives you about 6 months in game before insurgents come out and try to destabilize your regions. While being attack you have to make decisions that could make you reputation or ruin it. It might even cost some money(in game money) to make those decisions. The only things that I think is bad is how long the green units take to train. They should be less time because when your about 26 rep left that’s when the first green unit trains so please make it a shorter time. Thank you for reading have a nice day or night. Way better than plague. Being a military guy, I absolutely enjoy the ability to destroy the “insurgency” haha. I would like there to be more Governors, maybe have some US military type governors with pros and cons, that way you can take over in a better, more different way. One US governor of the area might be a military spec ops guy with the ability to quickly deploy units and have them fight harder, but con is that the people hate them even more than normal and they won’t cooperate as much? Not really sure on the idea, but I’ll let y’all run with it! Also, maybe another is like a General, and so on so forth. Thank you! Good luck with this amazing game James and everyone else! Whoo boy this is a double whammy compared to plague inc. it’s practically the planet of the apes dlc on steroids. Keeping track of military, cornering enemies with units, terrain, and buildings are nuts. Managing public demand and insurgent terrors are a frantic balancing act that feel addictively refreshing. 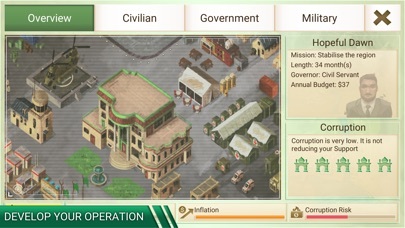 The UI is a tad clutttered and I didn’t really get the full front of political corruption on my first attempt so I can’t take that into account but believe me, it was an exhilarating and frantic all out mental war between me and the game and I somehow came on top on my first try (albeit on casual difficulty). Can’t wait to see what else the other modes have in store but, for now these are just my first thoughts. I finished my first game on Casual and found the game to involve several mechanics that I enjoyed to a great extent. I wish the tutorial had introduced me to a more thorough explanation of Corruption and the difference between actual Corruption and Corruption Risk. To those who are considering this game, if you liked Plague Inc, this will definitely check all the boxes for you! Other than that, I found that the game featuring a complex system of pacifying a region to be really fun, and I believe I will continue to explore this game on harder difficulties. I saw only a few maps, and I hope that more will be released, as well as several situations comparable to the developer’s other game, Plague Inc. I look forward to what comes next! I like the idea but this game cheats. The insurgents are impossible to kill and they always keep fleeing to different areas. It’s Just so ANNOYING! I have played this game ten times since I’ve downloaded it yesterday and 9/10 I’ve lost. It’s really upsetting. This game is high quality and I trust the company, but this game is so hard and bad I wish I could give NEGATIVE STARS. It’s just really bad. Can you please fix this game. It’s like the tuck rule it’s a little cool but at the same time useless and unnecessary. I don’t even want to put the rest of my troubles with this game in the review, but this app is very very hard, stupid and is actually pretty useless. I would rather be in that world getting killed by the air strikes than being the one who causes those air strikes. I’ve gotten better things at the dollar store for three dollars. Yes, yes a hundred a fifty million times yes. I’m already in love with Rebel Inc. I’ve been playing plague inc for years, and was so excited to see that you were producing a new game. I love the political/militaristic balancing act of stabilizing a region, and it’s super rewarding when you get it right. If I had any ideas to make it better, more maps, and diverse locales. Every map feels like it takes place in the Middle East. Maybe adding maps of stabilizing areas affected by drug cartels, or organized crime in locations like rainforest, bustling urban areas and other less desert style areas. Also having deployed coalition soldiers that have squadron or platoon names would be cool. Thanks for the new game! First off fans of Plague will notice some similarities, but rest assured that this is more than a “special virus” + reskin. Tactical placement plays a much more important role in this game. The game also plays much more like a “reverse” Plague, having to quarantine areas with insurrection and purge them one by one, while remembering crushing one flare up is a long ways from winning the war. Perhaps the most important similarity to Plague is the effort that has been made to ground the game with strong echoes of the real world. The challenges, events, and more call back again and again to the ongoing US conflicts in Afghanistan / Iraq. This is one of those touches that really enhance the experience I’ve played all of the maps at least once, and am looking forward to expansions / new game modes. I previously expressed disappointment in GameCenter integration, but that has been fixed. 👍 PS: this was the first paid game I ever preordered for iPhone. The moment I saw who it was from I knew I wanted to be all over it. 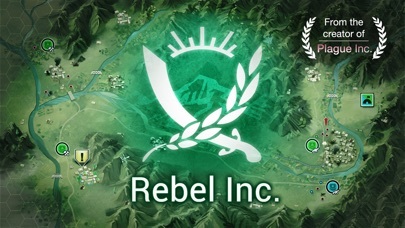 If you liked plague inc. you're going to like rebel inc. same concept but beside it being a world-wide spread epidemic this game cuts down to a large region within it there are tiny other regions, based on the Middle East and your goal is to stabilize all small regions while micro managing rebels and keep them at bay while you reach 100% stability across all the map that's it also they replace the bubbles as political decision seen in other games which goes well. Liked it so much it still manage to keep its roots and adds more and it evolves fantastically also it felt more down to earth and more realistically in some form. I had previously played Plague Inc. and thought it was a great mobile game that entertained and got one to use their brains. Now this is the type of political stimulation I can enjoy. Making decisions to help locals and gain their support. The old Hearts and Minds approach. While trying to fend off pesky insurgents without doing too much damage that will turn people against you. Very realistic game and if anything I would love to see another version come out where you can even do more with foreign relations. Possibly cut ties with countries supporting insurgents and likewise. Lot of possibilities but this game right now is so much fun. Enjoy it.